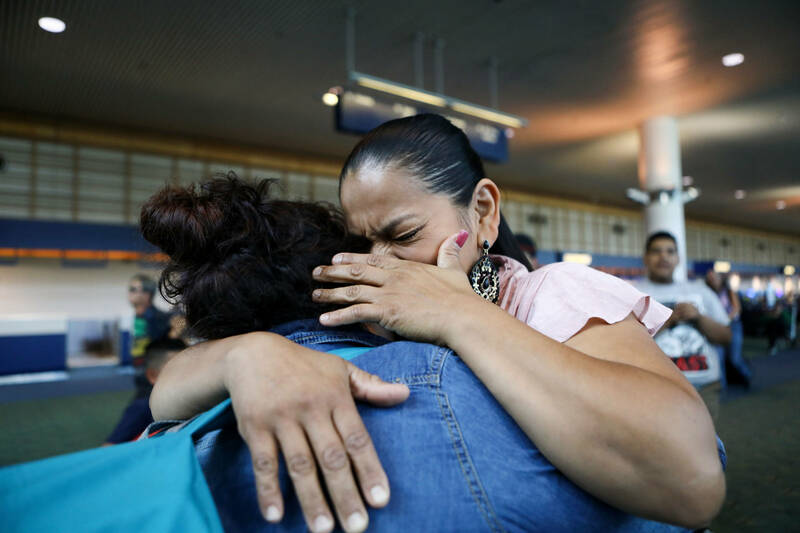 Sindy Ortiz Flores, 23, waited anxiously at San Francisco International Airport's Terminal 1 on Tuesday night, her gaze fixed on the stream of arriving passengers. Then Ortiz let out a sigh -- she had spotted her 18-month-old daughter, Grethshell Juliet. As a woman carrying Grethshell from the plane handed her to her mother, the little girl began to wail. Ortiz also burst into tears, clutching her baby tight for the first time in more than a month. 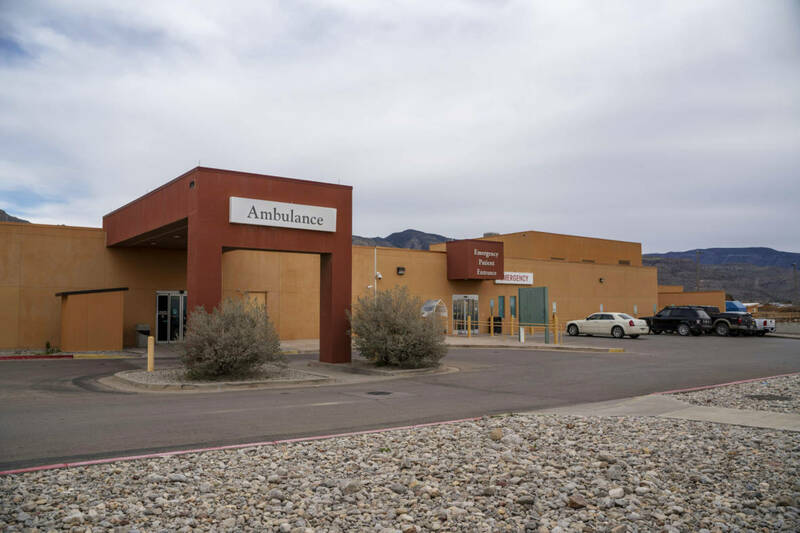 U.S. Border Patrol agents took Grethshell from her father, Kevin Ventura Corrales, on Dec. 28, after arresting him and the baby near Calexico. The government moved to prosecute Ventura for illegally re-entering the United States. Grethshell was turned over to the U.S. Department of Health and Human Services' Office of Refugee Resettlement, which placed her in a shelter in Texas. The move comes seven months after President Donald Trump signed an executive order halting most family separations at the border, and a federal judge in San Diego ordered the administration to end family separations, except in cases when the parent is unfit or a danger to the child. Government records say Grethshell's family left Honduras on October 2018, fearing persecution if they returned. Ortiz and her two older children got split up from her husband and Grethshell while in Mexico. Ortiz and the older kids made it to San Francisco, where relatives live. She said she is in the process of applying for asylum. Ortiz said their separation had been extremely difficult. "I felt desperate and helpless, not knowing what do do," said Ortiz, as she waited for her baby at San Francisco International Airport. "I've been so nervous, wondering whether they were going to give her back to me or not." Ortiz said she spent long weeks calling government agencies, first trying to locate Grethshell and then struggling to get her back. Lisa Castellanos, who works with the immigrant advocacy group Mijente, said the government initially demanded Ortiz pay $4,000 and provide a credit card number — neither of which Ortiz has — to cover the cost of her toddler's travel. Castellanos said that after the case attracted media attention, officials agreed to deliver the toddler to her mother without charge. Meanwhile, Ventura, Grethshell's father, who is also seeking asylum, remained in immigration detention in Arizona as of Monday. U.S. Immigration and Customs Enforcement officials said Ventura was charged with illegal re-entry into the U.S., a felony with potential jail time if convicted, and had been previously removed from the country four times. Ventura also had a previous misdemeanor for which he served less than a year in jail, said Assistant Chief Patrol Agent David Kim of the Border Patrol's El Centro sector. "The father was separated from the child because he was being criminally prosecuted for felony 8 USC 1326 (illegal re-entry)," said Kim in a statement. "Once a person is charged with a felony and they get rolled into the criminal process, a child is not going to accompany them." 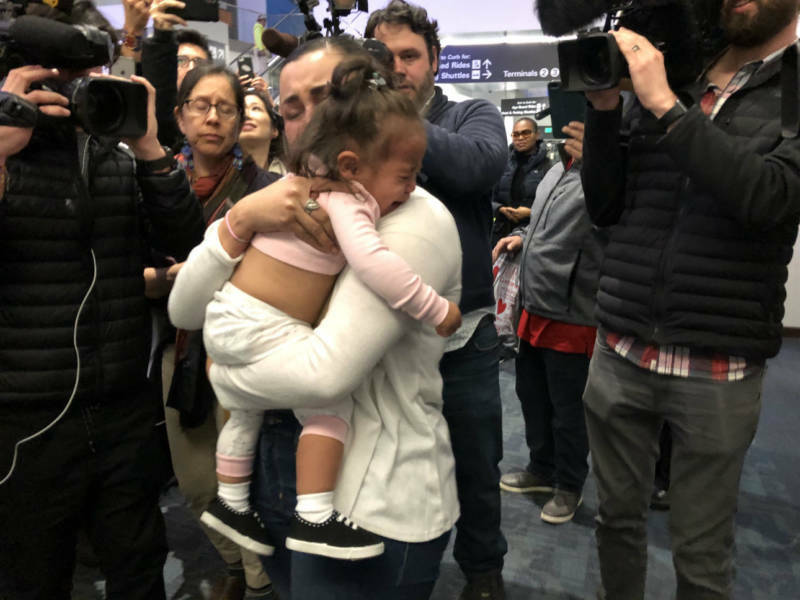 Kim and U.S. Customs and Border Protection officials did not further explain how Ventura was unfit or posed a danger to his child, the standard which would justify their separation under U.S. District Judge Dana Sabraw's order. Eric Fish, an attorney with Federal Defenders of San Diego, who represented Ventura in federal court, said the charge of illegal re-entry has been dropped. At the airport Tuesday night, Ortiz had a message for Trump: "Stop hurting families," she said.